Microsoft launched its first generation Surface Hub back in 2015. The ship date for the 55- and 84-inch Surface Hubs was delayed and it eventually became available in 2016. Compared to other Surface devices it hasn't shipped in great volumes, though it is a big investment, apparently Microsoft has only sold Surface Hubs to 5,000 customers across 25 markets. However, over half of the USA's Fortune 100 companies have purchased Surface Hubs to improve team efficiency and collaboration. A few hours ago Microsoft's Chief Product Office, Panos Panay, took the wraps off a new generation Surface Hub, pictured above. If you liked the idea of the original Surface Hub you will be happy to know the second generation devices is "sleeker, more agile and more affordable to fit any workspace or work style." At this time Microsoft is just announcing one size of Surface Hub 2 - 50.5-inches. This 3:2 aspect ratio 4K+ touch display can provide larger collaborative spaces though, through "the magic of tiling". In the Microsoft Blog you see up to four of these devices tiled together and the tiling options seem to be flexible with number of displays and their orientation. 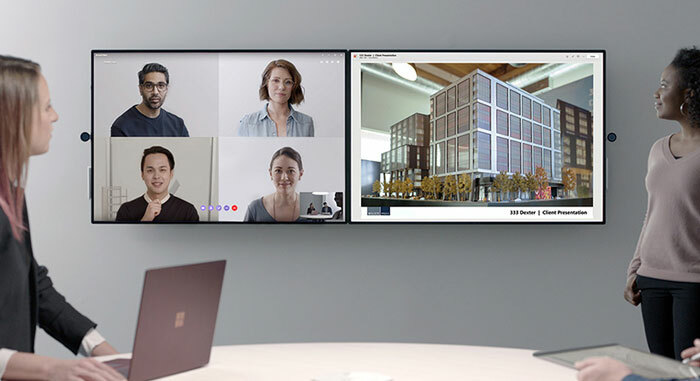 Other hardware facts we have at this preliminary stage, are that the Surface Hub 2 includes 4K cameras, integrated speakers, and far field mic arrays to facilitate the meetings and teleconferencing that many will use this device for. In example pictures of someone on Skype they appear to be approximately life size, as displayed waist-up on the screen (see image directly below). 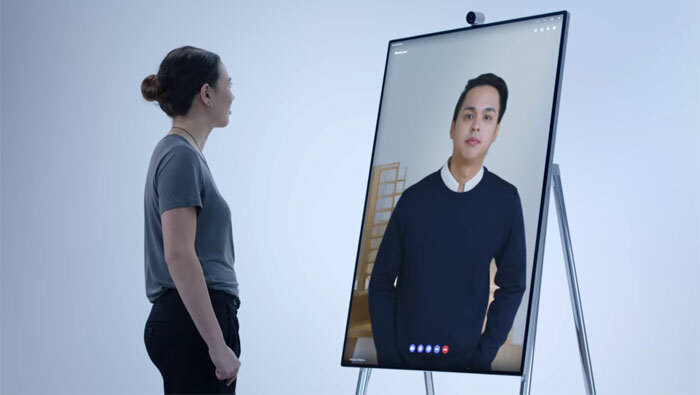 Microsoft has teamed up with Steelcase to create a system of rolling stands and easy-to-use mounts to help Surface Hub 2 customers. In the video you can see how easy it is to change from landscape to portrait on one of these rolling mounts. Lastly on the hardware front, there is a fingerprint reader for Surface Hub 2 users to log in and the device works with a Surface pen if you prefer that. Remember, in the basic sense, this is a full AiO PC with touch screen which you can use as you wish. However, Microsoft wants you to use it, and has designed it for, collaborative working in the likes of Microsoft Teams, Microsoft Whiteboard, Office 365, Windows 10 and the intelligent cloud. The Surface Hub 2 will be tested with select commercial customers during 2018 before becoming available for general purchase in 2019. How long before one of the users draws on it with a permanent marker? That augmented mirror mode in the third picture is amazing. You can change every aspect of your image, from clothes to body shape, face and gender!